What would you say about an investment that returned 5,500 percent? If you were lucky enough to have made the investment, you’d probably look for ways to reinvest most of it to earn more of those hefty returns. From 1989 to 2008, the state of California took $2.4 billion drawn from taxes on cigarettes and invested the funds into the California Tobacco Control Program, which spent the money on efforts to reduce smoking— from supporting community coalitions as they pursued no-smoking policies and practices to underwriting hard-hitting media campaigns (Lightwood and Glantz, 2013). According to a recent analysis conducted by the University of California, San Francisco, the $2.4 billion investment saved $134 billion—that’s the 5,500 percent return—from reduced medical expenditures that would otherwise have been needed to treat smoking-related illness (Lightwood and Glantz, 2013). I (Larry Cohen) worked on the nation’s first multicity no-smoking laws, and I am proud of the reductions in smoking, the lives saved, and the way we have changed norms across the nation and even the world. When I read about this 55-to-1 return on investment, I was pleased. But it also raised a question: Given how fruitful the investment, why hasn’t more money—substantially more—been devoted to prevention? In fact, very little of this $134 billion in savings has gone back into further efforts to prevent smoking. Moreover, a relatively small portion of the money raised from taxing tobacco and from legal settlements with tobacco companies has gone to prevention efforts. I (Tony Iton) am a physician who has worked successfully to ban smoking in bars and restaurants in Connecticut and now work on reducing the shocking and preventable life expectancy differences among neighborhoods in California. I continue to be frustrated because it seems we are clearly so much smarter than our health policy suggests. The 21st Century health challenges that we are now facing require the application of a vast amount of prevention knowledge that we have acquired. We don’t have to stand by and wait for people to become sick before we act. haven’t decreased significantly and on efforts to reduce access to tobacco products among young people (see Figure 1). It’s not just tobacco control that saves lives and money. Policies that require or promote the use of car seats (National Highway Transportation Administration, 2013), seat belts (U.S. Department of Transportation and National Highway Traffic Safety Administration, 2006) and helmets (U.S. Consumer Product Safety Commission, 1998) help to reduce deaths and injuries—and save money. Higher taxes on alcohol reduce consumption (Sleet et. al., 2009) and lead to savings. Yet with all of these diverse efforts, few of the dollars generated are used to reduce alcohol abuse, curb DUIs (Driving-under-the-influence offenses), or make sidewalks safer to reduce pedestrian injuries. Health care expenditures now cost our nation $2.8 trillion a year (expected to grow to $4.6 trillion by 2020) and account for one of every six dollars of our gross domestic product (Medicare Office of the Actuary, 2012). The trillion-dollar question is how to bring these costs down to a sustainable level. Leaders from public health, health care, government, business, and philanthropy want to know how to identify ongoing sources of funding for things that make people healthier—instead of waiting until people get sick or injured to take action. They understand that the most important change we can make is to reduce rates of preventable conditions that drive most health care spending (Prevention Institute et. al., 2008). To achieve this goal we need to create strong incentives for prevention within our health care system and develop a new, sustainable funding model for community-level prevention efforts (Hester and Stange, 2014). The details will vary by locale, but the concept we’re proposing is simple. 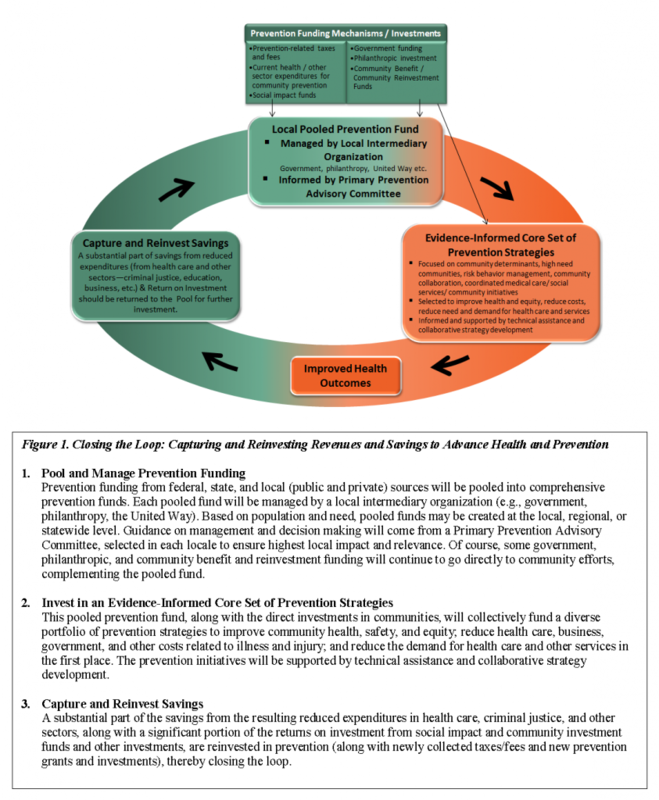 First, create mechanisms for investing in prevention (Prevention Institute, 2013). Then, use a significant portion of the funds saved by reducing health care (and other) costs to make further improvements and investments in prevention, creating a virtuous cycle that helps our people and our communities get healthier. In other words, we need a System of Prevention. Imagine having stable sources of funds for Safe Routes to School programs, which help kids both walk to and ride bikes to school without fear, and having enough money for playgrounds, school gardens, healthy lunches, and afterschool athletics. Imagine how over time these efforts would improve safety and lower rates of heart disease, diabetes, and cancer. Mexico is taking steps to close the loop. The Mexican legislature passed a peso-per-liter tax on soda and committed the funds over the next three years to ensuring the availability of fresh drinking water in every Mexican school (Cervano-Soto, 2014). The legislators are betting that less soda consumption and more drinking of water will reduce illness in the short term and chronic disease epidemics over time (Bittman, 2013). It’s a good bet. Startup capital: A significant initial investment in prevention is needed to support major initiatives—such as California’s successful tobacco control efforts—that can have big impacts. Funding could come from several sources. First, we need to ensure that most of the revenues from tobacco and alcohol taxes are devoted to prevention efforts. Second, as new sources emerge, such as tax revenue on soda or junk food or fees from marijuana legalization, the money could be combined with current philanthropic funding, social impact funds, hospital community-benefits funding, and prevention-oriented license plate fees. Many of these funds could be collected in local or statewide funding pools like the Prevention and Wellness Trust Fund in Massachusetts. Recapture: Once investments are made in prevention efforts, it’s critical to establish mechanisms for tracking the amount of money saved by health care and insurers and reinvesting a substantive proportion of those savings. A number of initiatives within the health care sector, including certain Medicaid waivers and pay-for-success models, build on the idea of capturing savings from lowering predicted costs. For example, social and health impact bonds in New York and California are built on the premise of recapture; resulting savings would be returned to investors, with the potential for some of the savings to be reinvested in prevention. Reinvestment: Once funds are recaptured, the next step will be to establish a reinvestment process, based on agreed-on criteria and strategies that promote health and wellness, even further reducing costs and savings lives. Closing the loop requires combating inertia with a sense of urgency and a reminder that most important things worth doing seemed impossible at some point. We’re seeing the growth of innovation in our health system, and closing the loop creates an opportunity to advance important collaborations and partnerships that can bring benefits to many sectors. Of course, every investment in prevention doesn’t bring in a return greater than its expense—what’s important about prevention is saving the lives and reducing the misery that health problems cause, and we should do everything we know how to do in the first place. According to one proverb, the best time to plant a tree is 20 years ago. Let’s avoid looking back with regret and instead plant trees today and seize opportunities for future bloom. Bittman, M. 2013. ¡Viva México! The New York Times, November 30. http://www.nytimes.com/2013/11/30/opinion/sunday/bittman-viva-mexico.html?pagewanted=all (accessed August 12, 2014). Cervano-Soto, E. 2014. As obesity grows, Mexico eyes Richmond-style soda tax. New America Media. http://newamericamedia.org/2013/10/as-obesity-grows-mexico-eyes-richmond-style-soda-tax.php (accessed August 12, 2014). Hester, J. A., and P. V. Stange. 2014. A sustainable financial model for community health systems. Discussion Paper, Institute of Medicine, Washington, DC. http://www.iom.edu/Global/Perspectives/2014/SustainableFinancialModel (accessed August 12, 2014). Lightwood, J., and S. A. Glantz. 2013. The effect of the California Tobacco Control Program on smoking prevalence, cigarette consumption, and healthcare costs: 1989–2008. PLoS ONE 8(2):e47145. Medicare Office of the Actuary. 2012. National health expenditure projections, 2012–2022. http://www.cms.gov/Research-Statistics-Data-and-Systems/Statistics-Trends-andReports/NationalHealthExpendData/downloads/proj2012.pdf (accessed August 12, 2014). National Highway Transportation Administration. 2013. Traffic safety facts 2011: Children. Traffic Safety Facts. 2011 data. DOT HS 811 767. http://www-nrd.nhtsa.dot.gov/Pubs/811767.pdf (accessed August 19, 2014). Prevention Institute. 2013. How can we pay for a healthy population? Innovative new ways to redirect funds to community prevention. http://preventioninstitute.org/component/jlibrary/article/id332/127.html (accessed August 12, 2014). Sleet, D. A., P. Howat, B. Maycock, G. Baldwin, and R. Shults. 2009. Interventions to reduce impaired driving and traffic injury. In Drugs, driving and traffic safety, edited by J. C. Verster, S. R. PandiPerumal, J. G. Ramaekers, and J. J. de Gier. Basel, Switzerland: Birkhӓuser Verlag. Pp. 439–456. Trust for America’s Health, Prevention Institute, Urban Institute, and New York Academy of Medicine. 2008. Prevention for a healthier America. http://www.preventioninstitute.org/component/jlibrary/article/id-75/127.html (accessed August 12, 2014). U.S. Consumer Product Safety Commission. 1998. News from CPSC: CPSC issues new safety standard for bike helmets. http://www.cpsc.gov/cpscpub/prerel/prhtml98/98062.html (accessed August 12, 2014). U.S. Department of Transportation, National Highway Traffic Safety Administration. 2006. States with primary enforcement laws have lower fatality rates, research note. DOT HS 810 557. http://www-nrd.nhtsa.dot.gov/Pubs/810921.pdf (accessed August 19, 2014). Larry Cohen is the founder and executive director of Prevention Institute and was the architect of the coalition achieving the first multicity no-smoking laws in the country in the 1970s. He was a coauthor of “Community-Centered Health Homes,” a strategy for engaging health care in community prevention efforts. Dr. Anthony Iton is senior vice president of The California Endowment, where he is the primary architect of Building Healthy Communities, a 10-year, $1 billion place-based initiative designed to improve the health status of 14 low-income California communities by 2020. Cohen and Iton previously coauthored “Time of Opportunity: Local Solutions to Reduce Inequities in Health and Safety” for the Institute of Medicine. The views expressed in this discussion paper are those of the authors and not necessarily of the authors’ organizations or of the Institute of Medicine. The paper is intended to help inform and stimulate discussion. It has not been subjected to the review procedures of the Institute of Medicine and is not a report of the Institute of Medicine or of the National Research Council.